The Big Three—Gov. Greg Abbott, Lt. Gov. 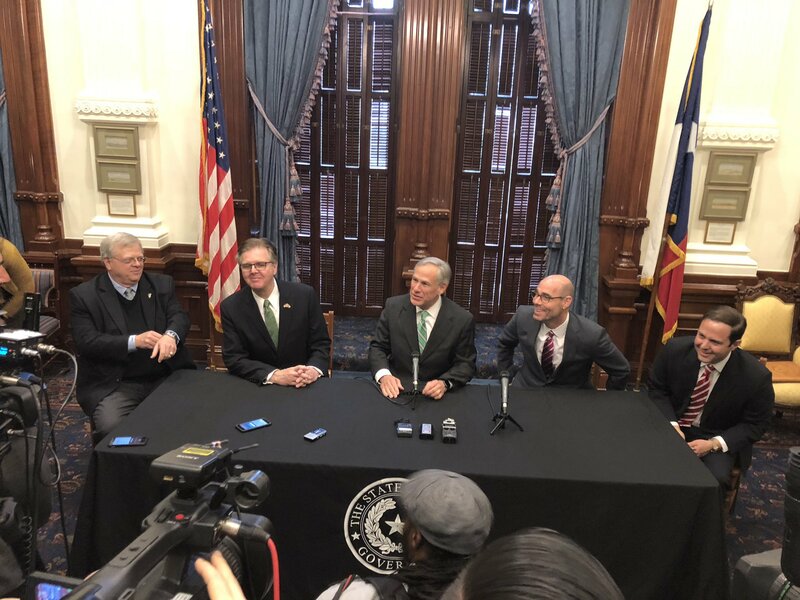 Dan Patrick, and House Speaker Dennis Bonnen—held a press conference this morning to announce that they had achieved a consensus on bills to cap local property taxes. Those three may be on the same page, but with so many unanswered questions about the plan’s costs, viability and a recognition that it alone does nothing but potentially harm schools, public education supporters were not sharing their enthusiasm. The idea of a cap wasn’t a surprise, since the governor had been pushing a similar plan heading into the session, and it became quickly apparent that House and Senate leadership weren’t looking for a repeat of last session when they couldn’t agree on a percentage of tax increases to cap. Cities and counties–which could easily be hamstrung from raising revenue and effective governance with a cap–where quick to criticize the proposal, as were several House Democrats, which pointed out that if we really want to address property taxes we should be working out the school finance fixes first. And so the big question remains the same as it did when Abbott first rolled out this proposal: Where will the state get the money to replace lost revenue to school districts with a cap? Speaker Bonnen was quick to jump in and say that the Big Three were still all committed to adding significant new money to public education, and Patrick chimed in to say that it was legislators’ jobs to “find revenue.” And here’s where the cause for concern comes into play. Although it’s unlikely that the state would let local school district revenue fall, how will the billions of dollars needed to make up for the tax cap impact the need for additional new investments in schools and educator pay? While TEA threw out an initial figure that the cap might cost more than $3 billion in the biennium, independent analysis by the Houston Chronicle reported a $43 billion loss in funds to school districts over 10 years if the cap had been put in place in 2008. The last time the Legislature attempted to reduce property taxes, the results were disastrous. A “tax swap” in 2006—supposedly replacing a reduction local school property taxes with changes to state business taxes—resulted in a loss of about $5 billion per year. Add a Great Recession two years later and public education ultimately faced $5.4 billion in cuts. Our view is consistent, that we need to Fund Our Future by investing significant new state money into public education, which will be the quickest and easiest way to slow property tax increases without constraining local governments.